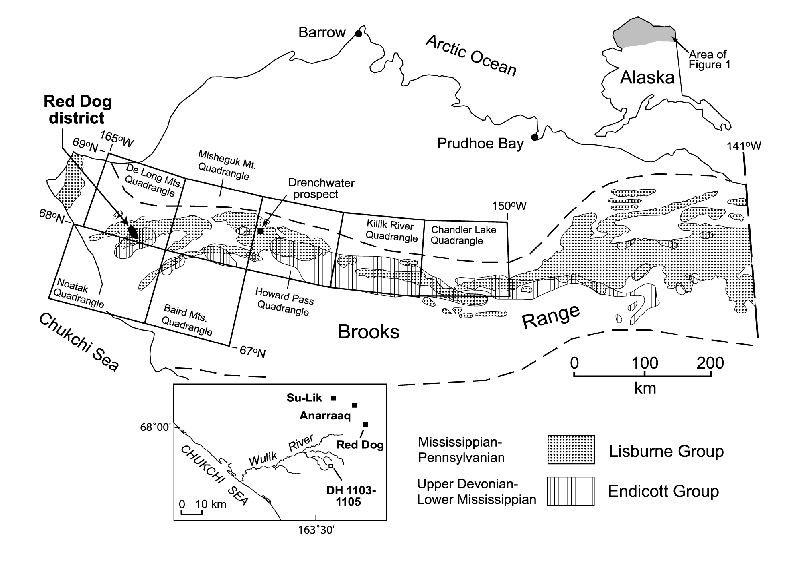 This report presents geochemical analyses for 210 unaltered and unmineralized rock samples of Paleozoic age in the western Brooks Range of northern Alaska. These data form the basis for a study by Slack et al. (2004a) on the provenance and depositional history of the Paleozoic strata, and on their metallogenic significance relative to the formation of large stratabound Zn- Pb-Ag deposits in the Red Dog mining district. Principal rock types that were analyzed include shale, siltstone, sandstone, chert, bedded siliceous rock, and calcareous radiolarite; selected samples of limestone, phosphate, and argillite, and one siderite concretion, were also analyzed. Note that the phosphate samples are from the central Brooks Range, east of the Red Dog district. The geochemical analyses are presented here in Microsoft Excel and .dbf spreadsheet formats in order to facilitate calculations and plotting of data. A related geochemical database on altered and mineralized rocks in the Red Dog Zn-Pb-Ag district is available in Slack and others (2004b). Data for elements, oxides, and other components are presented either in weight percent or parts per million, except for Au and Pd that are in parts per billion. Qualified values (shown by the '<' symbol) represent values less than the specified minimum detection limit (MDL). In some cases, the MDL for a particular element or component is not uniform, which reflects changing analytical conditions or matrix effects, or use of newer ICP-MS instruments that have higher precision and lower MDLs. For statistical treatment of data and other calculations, it is recommended that qualified values be substituted by one-half the analytical detection limit (Sanford and others, 1993). Note that the abbreviation "n.a." refers to a lack of analysis for the specified element or component. Values for the magnitude of the Ce and Eu anomalies are also presented. The magnitude of the Ce anomaly, Ce/Ce*, is calculated as: Ce[CN]/((La[CN])**0.667 * (Nd[CN])**0.333) where Ce[CN], La[CN], and Nd[CN] represent normalization of Ce, La, and Nd respectively to average chondrites using the data of Nakamura (1974). The magnitude of the Eu anomaly, Eu/Eu*, is calculated as: Eu[CN]/(Sm[CN]*Gd[CN])**0.5 with chondrite normalization of Eu, Sm, and Gd represented respectively as Eu[CN], Sm[CN], and Gd[CN]. For those samples without ICP-MS analyses for Gd, the Eu/Eu* values were calculated by a curve-fitting Excel macro program using INAA data for La, Ce, Nd, Sm, Eu, Tb, Yb, and Lu. In these formulae, two asterisks (**) are used to represent exponentiation; one alone indicates multiplication. Slack, John F., Schmidt, Jeanine M., and Dumoulin, Julie A., 2004, Whole Rock Geochemical Data For Paleozoic Sedimentary Rocks of the western Brooks Brooks Range, Alaska: U.S. Geological Survey Open-File Report 2004-1371, U.S. Geological Survey, Reston, VA.
Cerium anomaly (dimensionless). The magnitude of the Ce anomaly, Ce/Ce*, is calculated as: Ce[CN]/((La[CN])**0.667 * (Nd[CN])**0.333) where Ce[CN], La[CN], and Nd[CN] represent normalization of Ce, La, and Nd respectively to average chondrites using the data of Nakamura (1974). Here two asterisks (**) are used to represent exponentiation; one alone indicates multiplication. Europium anomaly (dimensionless). The magnitude of the Eu anomaly, Eu/Eu*, is calculated as: Eu[CN]/(Sm[CN]*Gd[CN])**0.5 with chondrite normalization of Eu, Sm, and Gd represented respectively as Eu[CN], Sm[CN], and Gd[CN]. Here two asterisks (**) are used to represent exponentiation; one alone indicates multiplication. I.L. Tailleur and J.M. Kurtak donated phosphorite samples for analysis. These data form the basis for a study by Slack et al. (2004a) on the provenance and depositional history of the Paleozoic strata, and on their metallogenic significance relative to the formation of large stratabound Zn-Pb-Ag deposits in the Red Dog mining district. Geochemical analyses were obtained mostly on samples from natural outcrops; some samples are of diamond drill core 3.5 or 4.5 cm in diameter. Samples were cut using water-cooled diamond saws in order to remove oxidized and(or) weathered surfaces. A small number of samples contain veins composed of quartz with or without associated carbonate and sulfides; these veins were also cut out before analysis. All samples were pulverized in an alumina ceramic mortar, which in some cases may have produced very minor contamination by trace amounts of Al, Ba, and(or) rare earth elements (REE). Prior to analysis all samples were fused with lithium metaborate/ tetraborate to insure nearly complete acid digestion of resistate minerals such as zircon, monazite, rutile, chromite, and barite. Most samples were analyzed by Activation Laboratories (ACT Labs) in Ancaster, Ontario, using methods described on their web site: www. actlabs.com. Major elements, most trace elements, and REE were determined by inductively-coupled plasma mass spectrometry (ICP-MS), using an approach similar to that of Jenner and others (1990). REE in some barite samples were analyzed by high-resolution, magnetic sector ICP-MS using an ion exchange technique in order to eliminate Ba interference on Eu. Volatiles and related components (total C, CO2, Corg, S, SO4) were determined using conventional methods as described in Jackson and others (1987). Fluorine was analyzed by the ion selective electrode technique (Jackson and others, 1987). Data for Sc, Cr, Co, Au, Sb, As, and Se in most samples were obtained by instrumental neutron activation analysis (INAA) (Hoffman, 1992), which provides more precise results than by ICP-MS. Au concentrations in most samples of semimassive and massive sulfide were also obtained by flame atomic absorption (Aruscavage and Crock, 1987) by XRAL Laboratories of Denver, CO, using on splits of the same rock powders that were earlier run for major and trace elements, and REE. A smaller group of samples was analyzed by the U.S. Geological Survey in laboratories at Denver, Colorado, Reston, Virginia, and Menlo Park, California. Major elements were determined by X-ray fluorescence using the methods of Taggart and others ( 1987). Concentrations of volatiles and fluorine were determined by the same procedures as outlined above, except that separate determinations of organic carbon were not made. Where data for CO2 are available, organic carbon contents were calculated by percent difference using results for total carbon. Minor elements were analyzed by inductively coupled plasma-atomic emission spectometry (Lichte and others, 1987), except for Rb, Cs, Ba, Zr, Hf, Ta, Th, U, Sc, Cr, Co, Ni, Mo, Zn, Au, Sb, and As and REE (La, Ce, Nd, Sm, Eu, Tb, Yb, Lu) that were determined by INAA (Baedecker and McKown, 1987). Slack, John F., Kelley, Karen D., and Clark, Jeffrey L., 2004, Whole rock geochemical data for altered and mineralized rocks, Red Dog Zn-Pb-Ag district, western Brooks Range, Alaska: U.S. Geological Survey Open-File Report 2004-1372, U.S. Geological Survey, Reston, VA. Precision and accuracy for concentrations 100x the minimum detection limit (MDL) was generally better than ±5 % relative, and in many cases such as for major elements was better than ±1 % relative. For concentrations approximately 10x the MDL, precision and accuracy were about ±10-20 % relative depending on the method used. Although all data published in these grids have been used by the USGS, no warranty, expressed or implied, is made by the USGS as to the accuracy of the data and related materials. The act of distribution shall not constitute any such warranty, and no responsibility is assumed by the USGS in the use of these data or related materials.